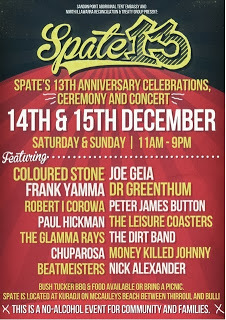 The Sandon Point Aboriginal Tent Embassy (SPATE) and the North Illawarra Reconciliation & Treaty Group (NIRTG) will co-present SPATE’s 13th Anniversary Celebrations, Ceremony and Concert. The celebrations will be held at the Embassy on McCauleys Beach, Thirroul NSW on the weekend of Saturday 14th and Sunday 15th December 2013 from 11am to 9pm. SPATE 13 is an alcohol-free event for Community and Families. Entry is by donation. Fred’s Bush Tucker BBQ & other Food and Chai Tent will be available or bring a picnic. SPATE is located at Kuradji, on McCauleys Beach north of Sandon Point between Thirroul and Bulli. No parking on site. Live entertainment will include a concert featuring local and visiting artists: Coloured Stone, Joe Geia, Frank Yamma, Dr Greenthum, Robert I Corowa, Peter James Button, Paul Hickman, The Leisure Coasters, The Glamma Rays, The Dirt Band, Chuparosa, Money Killed Jonny, Beatmeisters, Golden Orb, Nick Alexander, Lisa & Tony, Daddyo, Blak Boi, Paranoia Club, Evie J Willie. Does my house look big in this?